STATUS: MOST OF THESE BOXES ARE (PROBABLY?) MISSING. See descriptions for individual status reports. The following information is from years ago, when most of the boxes were still there. I keep this online for those who did find these boxes, and want to remember where the stamp came from. When I carved my first Seacoast-related letterbox stamps, I didn’t realize that others had used that same name for their stamps and letterboxes, too. This box was planted in 2002, and — last reported in 2009 — I’m not sure if it’s still on the trail. The logbook has been replaced at least three times, but the box remains one of my most popular, ever. This letterbox is on the trail to an earlier (and, frankly, far better) drewclan letterbox. It’s at Odiorne Point Science Center park, and you’ll pass my box if you’re on the winding path to the drewclan letterbox. And, in case you’re trying to figure it out, the stamp is supposed to show a lighthouse. Odiorne Point Science Center park is an ideal spot for hiking, bird watching, or letterboxing. 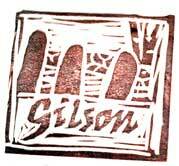 This stamp–now missing–was at the Urban Forestry Center, not far from where Yoken’s was, in Portsmouth, NH. It was hiding inside an old tree. About a year after I planted the letterbox, the tree was cut down and the letterbox seems to have vanished with it. 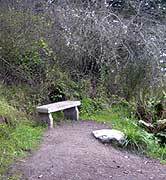 It was an ideal location for letterboxing, but the mosquitoes can be ferocious during a warm, damp year. All of the following letterboxes were planted before 2004. Every one of them was reported missing around 2007. 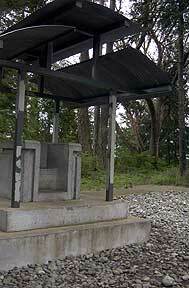 I used to visit Fort Worden every year. After 2004, I moved and stopped going to the fort. So, I was unable to maintain these letterboxes. Since then, all have been reported missing. This one was easy to find, but the stamp is missing now. It was at the main desk at the office at Fort Worden State Park. They kept it in the box directly behind the counter, with the Junior Ranger stamps, and so on. Though the letterbox is now missing, these photos show the park and a possible location for future plants. 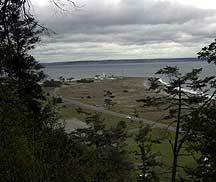 At Fort Worden State Park, find Battery Stoddard. It’s an easy walk from the office. 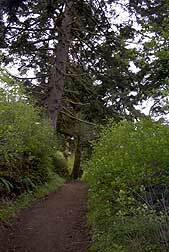 Take the trail uphill, just west of Battery Stoddard. Continue straight up the trail, past the wooden step-like rails. Continue past the first bench. Pause and sit at the second stone bench, and enjoy the view. Stand, and turn to your right. Take about 38 paces uphill on the trail. You’ll go past two “waterbars” in the ground. They look like railroad ties, with Xs across them. Continue up the trail. About 19 paces from the second waterbar, on your left you’ll see a large evergreen tree with a burrow started in the base of it. The letterbox was tucked just in back of that tree. It wasn’t a very secure location, but it was a nice, easy find for beginning letterbox hunters. This is where another of my letterboxes was. At the vault, find the sheltered chair. The letterbox was in a green-lidded Rubbermaid container, hidden in the ivy in the elbow of the trees. Again, it’s not a red-hot location, but I created these letterboxes to introduce people to letterboxing. Yes, I knew the boxes would vanish. I was okay with that. During a 2004 arts event, attendees had a chance to find at least one of my letterboxes. That’s why I created them.